After browsing through a pile of recipe magazines, ideas set in and I execute them in the kitchen with the ingredients that I have. A life of creating recipes leave my mind bone-dry of ideas sometimes. There are no fireworks, no light bulbs turning on nor thought bubbles helping me. It's just me and an empty mind. But here is a result of something that inspired me enough to create a delicious dessert using simple ingredients and a straightforward procedure. 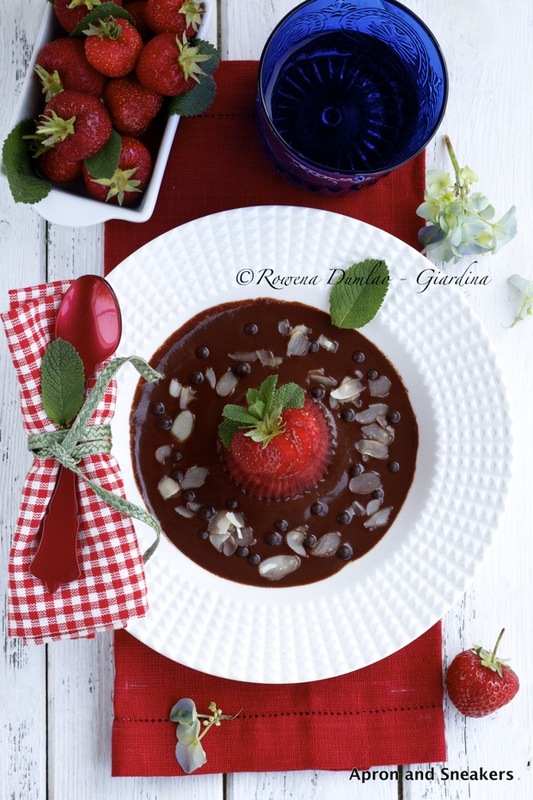 Strawberries, chocolates, Marsala wine, almonds and mint are some of my favorite ingredients and I put them altogether in this slurpy dessert. This had been a fun dessert. You might enjoy it too. Wishing you all a wonderful Thursday! In a medium saucepan over medium heat, cook the strawberries with the sugar and vanilla seeds. When it boils, put down the heat to low and simmer for 10 minutes, stirring once in a while. Skim off foam. Add the agar-agar halfway through cooking until completely melted. Transfer the strawberries to 4 muffin molds. Refrigerate for at least 3 hours or until they completely set in. In a medium saucepan over medium heat, bring milk to a boil. When it boils, pour in a bowl with the chocolate inside. Add Marsala wine. Whisk the milk and chocolate until smooth. Add sugar to taste. Let it cool. 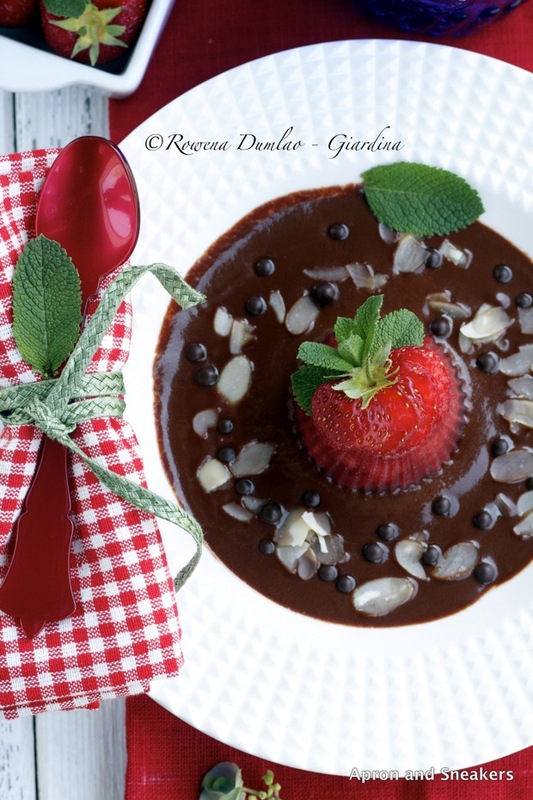 To serve, Pour some chocolate sauce in individual bowls or plates. 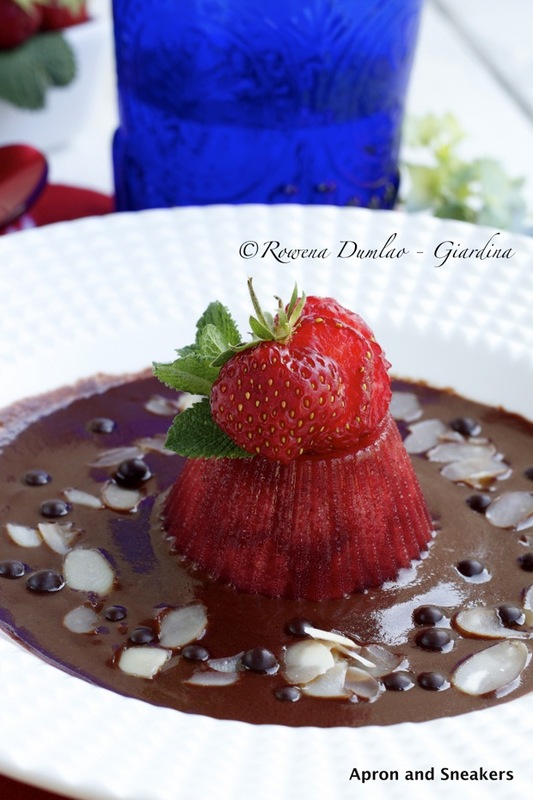 Put the strawberry jellies on top of the chocolate sauce. Garnish with mint leaves, shaved almonds or sliced strawberries.